In preparation for the new installment coming out this month, my brother and I decided to watch the original Star Wars last night. It is amazing to me how well that film holds up almost four decades later. It is perfectly paced, beginning small, and constantly expanding until culminating in the final Death Star battle. I hope the new film finds a way to present a villain worthy of following in Darth Vader's footsteps, that guy is a tough act to follow. Darth's claim on this cover was explored back in STF #282. 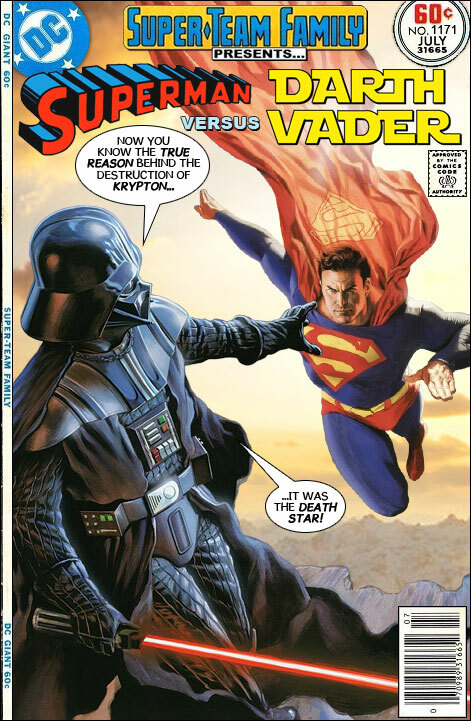 You know Darth Vader and the Death Star being behind the destruction of Krypton would be a great idea for a crossover. YES! Thank you, Ross. This is precisely the fight I've fantasized about since the original release of the Christopher Reeve classic in 1978. Is there a way to purchase prints of these? Too much legal red tape would be involved for that. Superman and Thor in "Sins of the Sons!"